The VA25-HP (DA) high pressure double acting diaphragm pump. no need for ancillary equipment to regulate flow at raising discharge pressures. low to high pressure switch to be more efficient. It is therefore said to be ideal for filter press applications. 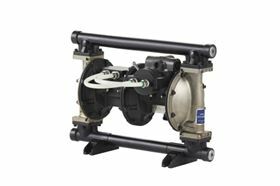 The existing range of high pressure diaphragm pumps, a single acting pump type, deliver fluid pressures up to 2x the supplied compressed air pressure. This results in a pulsating flow, a high compressed air consumption and a reduction of the flow rate of 50%. The VA25-HP (DA) has a switch to change the pump operation from low pressure to high pressure. At low pressure setting the pump operates in normal, low pressure mode with an optimum use of the compressed air. At high pressure the pump boosts up the liquid pressure to 2x the compressed air pressure with flow rates that double the flow rate of the single acting high pressure pump. German manufacturer of pumps and systems for fluid metering, Lewa GmbH, will be showcasing its hygienic pump heads and valves at Hannover Messe 2017.